June 18, 2015 - Steven Metheny, 45, Medford, Oregon was sentenced Tuesday to 12.5 years in federal prison by U.S. Chief District Court Judge Ann Aiken after his convictions for conspiracy to commit mail and wire fraud and the making of false statements in defrauding the United States Forest Service in procuring helicopter firefighting contracts in 2008. Levi Phillips, 48, Grants Pass, Oregon, was also sentenced today for his role in the conspiracy. Phillips pled guilty on September 23, 2013, to the crime of conspiracy to commit mail and wire fraud. Judge Aiken sentenced him to serve 25 months in federal prison. Both defendants were ordered to surrender to Bureau of Prisons on August 17, 2015, and upon release from prison, both will serve a three year term of supervised release. In 2008, Metheny, as Vice President of Carson Helicopters in Grants Pass, Oregon, and aided by Phillips, the Director of Maintenance for Carson, submitted contract bid proposals on behalf of Carson to the Forest Service with falsified helicopter weight and balance charts and falsely altered Federal Aviation Administration (FAA) helicopter performance charts. These charts were then used by the Forest Service in determining whether Carson’s helicopters met minimum contract payload specifications and, as a result, awarded contracts to Carson that it would not have received otherwise. The contract awards amounted to over $51 million dollars. 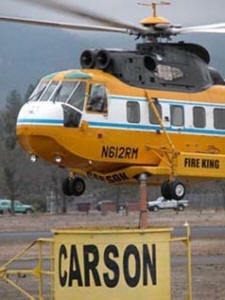 Carson received nearly $19 million dollars before the Forest Service discovered the fraud and cancelled Carson’s contracts following the crash of Carson helicopter N612AZ in California. According to documents filed with the court, Assistant U.S. Attorney Byron Chatfield said Metheny schemed with Phillips to create a formula that allowed them to enter a desired weight and center of gravity to generate the necessary scale readings needed to deceive the Forest Service into believing that two of Carson’s helicopters had actually been weighed as required by the contract. Metheny then used the formula to create false weights for other helicopters including the crash helicopter. Metheny also created a falsified FAA helicopter performance chart used in conjunction with the false helicopter weights in order to meet the minimum contract payload specifications for much more lucrative contracts. The Forest Service had previously warned Metheny about not using the actual performance chart it was created from, prohibiting its use for bidding purposes or field operations because it was intended for emergency operations only and its use compromised safety and gave Carson an unfair competitive advantage over other helicopter operators. On August 5, 2008, N612AZ crashed during takeoff while conducting firefighting operations. The crash resulted in nine fatalities and four were severely injured. The pilots utilized these same falsified charts in the flight manual in determining the payload calculations for the fatal flight. The surviving and permanently injured co-pilot of N612AZ said that pilots trust the integrity of the charts with their life; if the weight of the helicopter is wrong, the final payload will be wrong. If he had known, he would never have used those charts. Other pilots also stressed the importance of using accurate charts as an integral part to the safe operation of a helicopter, especially when carrying passengers. If the Forest Service manager at the crash site had known the truth about the falsified weight documents, the operation would have been immediately shut down and the firefighters would not have been allowed on board the helicopter. National Transportation Safety Board (NTSB) investigators would later discover the accurate weight documents for the crash helicopter and learn that it weighed over 1400 lbs. more than the falsified weight documents used by the pilots. Within days of the crash, Metheny replaced the crash helicopter with another helicopter for the contract by using falsified FAA power performance charts and weight documents for that aircraft. Court documents further disclose that following the crash of N612AZ, Metheny and Phillips then attempted to conceal the fraud by devising schemes to prevent the Forest Service from discovering the actual weight of each aircraft under contract. Their schemes included having Carson pilots and crew improperly remove equipment and helicopter components without recording their removal. However, some refused and one crew chief explained that he was done lying about the helicopter’s weight. The Forest Service eventually discovered that all of the aircraft were over their bid weight, the weight documents submitted in the contract proposals were fraudulent with underreported weights and the helicopters were using falsified performance charts. All of the contracts were terminated. Government documents show that Metheny also concealed the fraudulent conduct involving N612AZ from the NTSB during its crash investigation. He and Phillips were Carson representatives on the NTSB investigation. Yet, Metheny knew NTSB investigators were relying on the falsified weight documents used by the crash helicopter and he attempted to convince them of their accuracy. Later, when NTSB discovered that the performance chart used by N612AZ was falsified, the product of a “cut and paste” created at Carson’s Grants Pass office, Metheny attempted to throw suspicion onto a former employee, someone he held animosity toward. Chatfield said that helicopter firefighting operations certainly have a high level of risk where failure can have catastrophic consequences, such as with the crash of N612AZ. Yet, what is totally unacceptable is the substantial risk Metheny created by his fraudulent conduct, unnecessarily putting the lives of so many pilots and firefighters in harm’s way. Metheny’s conduct has had such an adverse and lasting impact on so many people, both financially and emotionally. To know that those firefighters who lost their lives would not have been even allowed on the crash helicopter if the Forest Service manager or the pilots had known about the falsified weight is absolutely devastating to their families.